You may have read the breathless reporting on November 10 and 11, 2008. "A large new study, disclosed this week at a scientific meeting of the American Heart Association in New Orleans, found that even among people who appear to be in good health with relatively low cholesterol, the blood test could be a strong gauge of heart disease or stroke risk. If the test detects a high level of a specific protein, patients could reduce their risk of heart disease by using popular statin drugs, the study found. "This kind of study probably will change cardiac practice," said Dr. Deepak Srivastava, director of the Gladstone Institute of Cardiovascular Disease at UC San Francisco. "The test will likely become part of the panels that are routinely done. The study provides pretty compelling evidence that even if people have normal cholesterol levels, then they would benefit from statins if they have signs of increased inflammation." A small percentage of the population with unusual blood indicators and already at low risk of total mortality can reduce their risk by about 0.5% by taking Crestor in the short-term. The long-term effects remain untested. Only those who do not have immediate side-effects may benefit. This study effectively disproves the cholesterol hypothesis of heart disease. Although incidence of heart attacks and strokes was higher in the placebo group than in the test group, total mortality from these causes was the same. It is important to note that very careful screening was done to reduce the number of confounding effects of the study. While this led to more successful outfcomes, it also limits the applicability of the study. Before the study was cut short, there were indications of increased diabetes in the test group. Some reports have said that C-Reactive Protein is the cause of heart disease, but it is more likely an indicator, same as various cholesterol levels, visceral obesity, and high blood pressure. In a nutshell, even though the study showed that for 8900 people with an unusual and very specific blood profile and screened medical histories, taking Crestor for a year and a half will delay 49 deaths. That's a good thing probably. It is tough to generalize this for several reasons. 1. The study was terminated early. 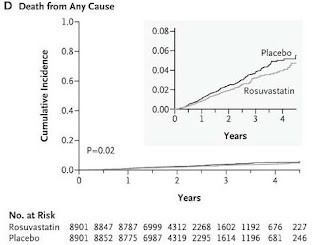 Long-term effects of statins can be harsh, but did not have time to show up. 2. Very specific filters were applied to the people in the study including age, family history, blood markers, etc. 3. Elimination of people who had very early negative responses to the statins. 4. 25% of the statin group stopped taking the medicine. How did this impact the results? How were they included or not in the findings. 5. There are several conflicts of interest, which may or may not be meaningful, but are of note. "...Suddenly, increased numbers of rhabdomyolysis reports began to surface in Crestor users associated with secondary kidney damage and a more ominous threat of specific primary renal toxicity as well and the necessity to issue emergency warnings advising doctors to exercise special caution in the use of this drug with hypothyroidism, renal insufficiency, Asian sub-population groups and cyclosporine and gemfibrozil takers. Not a terribly auspicious welcome for Crestor, this new statin drug known for strength in a market already dominated by other powerful statins. "Crestor is just another strong statin, using the same mechanisms as the others and having all the inherent potential for side effects. My books tell of the inevitable harm to the mevalonate tree by statins but that was the only way drug company biochemists could inhibit cholesterol so they did it anyhow, regardless of the potential for collateral damage. Does this action reflect sound judgment? They knew that inhibiting cholesterol at this point would also inhibit CoQ10, dolichols, normal phosphorylation and selenoprotein. Every doctor once knew this for they were taught it in medical school but few have bothered to review what mevalonate inhibition really means. In my books I refer to this as "girding" of the mevalonate tree. "We have now learned much more about the side effects of Crestor. We have learned that cognitive, muscle and nerve problems, due to the inevitable impairment of glial cell cholesterol synthesis and mevalonate blockade are only part of the problem. The Crestor side effect potential, that it shares with all other statins, is far more basic than this. Now we have learned that mitochondria are an inevitable target of statins. Because of inhibition of CoQ10 availability with its powerful anti-oxidant effect, mitochondria are left fully exposed to the mutagenic effect of free radicals. The resulting mutations of mitochondria are what is causing the legions of permanent, disabling side effects. "Permanent neuropathy, permanent myopathy, chronic neuromuscular degeneration, and Parkinsonism and ALS-like cases now are thought by some to be the result of permanent statin-induced, mitochondrial damage. Furthermore, the inherent ability of the body to identify and correct the daily load of mutations is impaired because of the previously unrecognized effect of dolichol inhibition from the earlier mevalonate blockade. If this is beginning to sound like a domino effect, you are right. We still are seeing the dominos topple one by one as time goes by - the result of marketing a class of drugs before it was fully investigated. Crestor 20 mg per day, contrary to the study and to many statin studies, will not be tolerated for long by the majority. Muscles aches are not common--they are inevitable, sometimes incapacitating. While JUPITER showed 15% of both treatment and placebo groups experienced muscle effects--no different--this is wildly contrary to real life. He has some other great insights as well and a data table. ..."Finally, the fishiest thing of all. They stopped the study right in the middl e of it. When studies are done that might put people at risk by giving them potentially dangerous drugs, it is typical for an outside group to take a peek at the data at certain milestones to make sure the study medication isn’t killing people. When this data is evaluated, and it is found that subjects on the experimental medicine are dying at unacceptably high rates, the study is often halted. I’ve never seen a study halted because the placebo group was dying at higher rates. That really makes me wonder. "One of the negative findings in this study was that the group on Crestor developed diabetes during the trial at a significantly higher rate than did those on placebo. I suspect that the outside group checked the progress of the study, found that the subjects on Crestor were at the time of the evaluation showing better results than those on placebo, so the decision was made to stop the study while it was looking good. Had it gone on for the full term, the deaths could have evened out, way more people could have developed diabetes, or who knows what might have occurred had the study continued. So, the powers that be decided to quit while ahead." "If anything, this study is just another bit of proof that total cholesterol and even total LDL are not the proximate cause of heart disease. Oxidation and resulting inflammation are. Furthermore, it suggests that reducing inflammation has a far greater benefit than reducing LDL cholesterol. I agree. So why won’t the medical establishment acknowledge this? The bigger question is: why would any doctor agree to prescribe a dangerous, expensive statin to the general public to save a few more lives by reducing inflammation (NOT by reducing cholesterol), when this could be far more easily and more significantly achieved (at far less cost, with far fewer side effects and with far greater effectiveness) with Omega 3-rich oils (I herein disclaim that I sell fish oil) and a few simple dietary adjustments like cutting back on grains and trans fats? "The fact that the media has bought into this hype again reminds me to remind you that all health decisions are best left to the expert - in this case, it’s YOU. You know what to do." Remember: Your health choices are yours. Educate yourself. Logic and science are a big part of medicine and your physical and emotional well-being. Just because your surgeonis good with his hands, it does not mean that he is worth squat when it comes to biochemistry. Make intelligent, informed choices. Don't go onto powerful drugs until other less intrusive approaches (like diet, exercise, sun, and sleep) have failed. This is a good link on what you can do to reduce C-Reactive protein without taking statins. --Vitamin D-- ...the effect is profound. --Elimination of junk foods--like candies, cookies, pretzels, rice cakes, potato chips, etc. --Exercise--Amplifies the benefits of diet on CRP reduction. --Fish oil--...the anti-inflammatory effect is modest from a CRP perspective. However, there are anti-inflammatory benefits beyond that of simple CRP. Great article. I agreed with every word. The health -- and scientific -- world needs people like you, thinkers, not just technicians. Nor just businesspeople. We need both, but neither are the right ones to put all the pieces together 9 times out of 10. Thanks for the kind words Christoph. It's as if there are three camps with very little overlap. There are the researchers who often have clear conflicts of interest. There are the reporters who have little knowledge of science, but rather simply spit out the conmtents of press releases. And finally, disinterested third parties who understand the nature of scientific inquiry and can write about it. New York Times did a pretty nice job on this. "...That would be a boon for some drug companies, but whether it would be good for all patients remains an open question." "Given that half of all heart attacks and strokes occur in people whose cholesterol is not considered high, it seems likely that there is a group of people with normal cholesterol who could benefit by taking statins. The task ahead for the writers of medical guidelines is to define just who those people might be." Thanks for gathering those sources together. Too often the general public takes the summarized and sensationalized headlines about studies as truth without a second thought. Unfortunately, those are the same people who would see this article and dismiss it because it'd take too much time to read it.